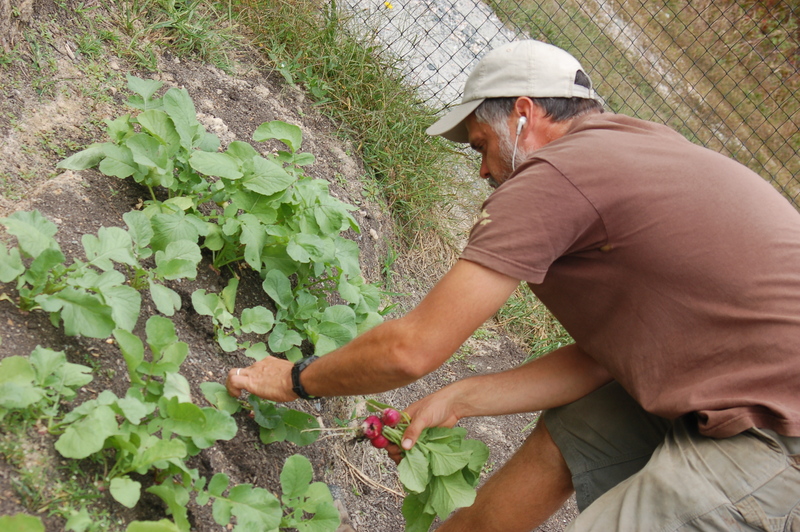 Dan, while planting, seeding, harvesting, watering, plowing, tilling, or spreading compost usually listens to sports podcasts in the morning and political podcasts in the afternoon. Though sometimes it’s a Lunchtime French Lesson or a Dharma Talk. 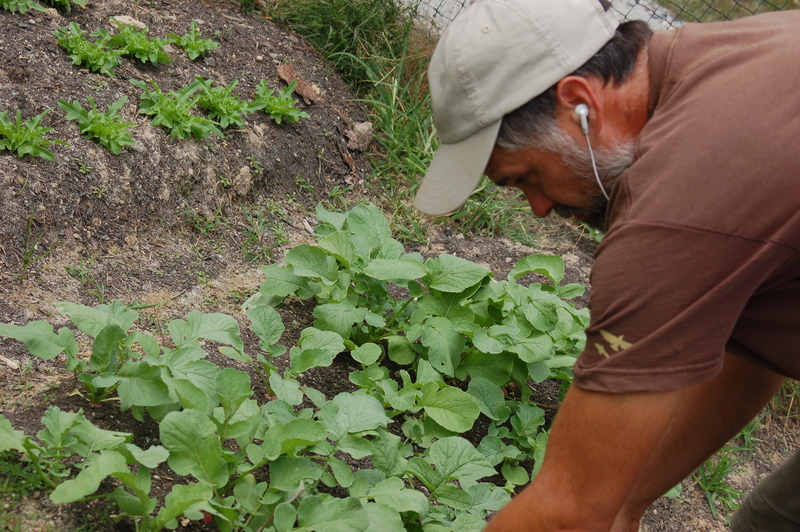 When I, Janet, am cutting flowers or harvesting okra or whatnot, I do not have earbuds in. No IPod for me. Here are the reasons: 1) I am the Luddite of the group, 2) I am also listening out for any one of the three children who may need attention, and 3) I spend more time than anyone else in front of the computer (ironic given my Luddite tendencies, eh?) and so I greatly cherish the moments I get to spend hearing the birds, wind, crickets and the like. But here’s the real story today: One of these teenagers is doing her senior mentorship at our farm this year. She is learning about small-scale, sustainable agriculture while she works. She is writing some papers about it and formulating a project related to the subject. She showed us her first journal paper this past week. And it made me cry. Granted, I’m technically still postpartum, with this 9 month old baby on my back while I harvest, on my lap while I write on the computer, or in my arms behind our table at market. I have a tendency to be emotional. But still. To read about a teenager’s growing awareness of how many units of product are harvested versus how many are actually saleable…her realization, after harvesting tomatoes, of just how much work is needed to trellis and prepare for planting the next round of tomato plants (because she got to take part in that as well)…her sensitivity to the struggle of growing plants in the squash family, as she sprays them with soap and sees that still there were no fruits to harvest…her admission that she hadn’t thought much before about the story and process behind the produce she saw for sale. Her understanding now of how chemical fertilizer differs from organic methods and why they are important. I might be alone here, but I found it powerful to read how a 17 year old is thinking about these issues. And I thought she was just out there listening to musicians I’ve never heard of. 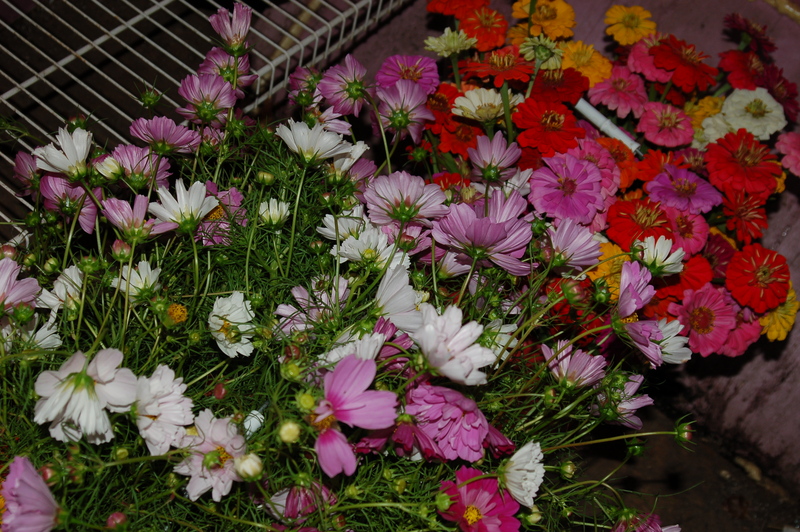 Arugula, Basil, Bell Peppers (purple, green, red, and orange), Green Beans, Green and Red Tomatoes, Jalapeno Peppers, Heads of Lettuce, Microgreens, Okra, Onions, Parsley, Radishes, Salad Mix …and Eggs, and Bouquets of Flowers. Kale and Chard look like they’ll be ready for next week. Reminder: Next Farm Tour: Oct 20th at 4:00 pm ~ To coincide with events for the week of National Food Day! No fee, family friendly. Please, no pets. Next Post Fridays. Are. Busy. Tell Dan NOT to update to iOS 6 if he enjoys playing podcasts in a playlist!!!! Awesome post by the way.